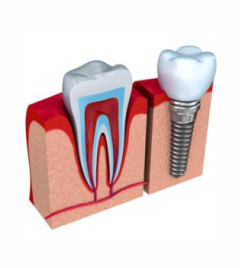 Dental Implants are metal posts (usually titanium) that are surgically inserted into the jawbone to act as a root for an artificial tooth. The implant fuses to the bone in a three to six month period and once it is secure the artificial tooth can be mounted on top. Implants are a stable support for crowns, bridges or even dentures. There are other treatment options for damaged teeth, in some cases this is the best way to restore the appearance of your mouth and your ability to chew normally. While we do not place the actual implant, we work closely with the oral surgeon, until the implant site has healed and the restoration (crown) can be placed (that's where we come in). To find out if an implant is the right option for you, simply schedule a visit for an evaluation with Dr. Borders. We accept a wide variety of dental insurance providers, as well as Care Credit as a form of payment. If you’re ready to schedule a visit, contact us today!